The Gunpowder River is flowing at 174 Cfs is clear, and 52 F. Bwo’s have brought many fish up to the surface for a looksee this week. With higher than normal flows, the river is full of water and the wild fish are looking for an easy meal. Streamers are an effective way to cover the cut banks and log jams in search of larger fish. We have lots of light bright zonkers and crystal buggers in the muffin tins on the front counter. The river level should continue to drop through the weekend. Thanks to Mark Noble for the stream report. Thanks for the information last Thursday morning. I did fish the upper river, parking at the upper lot on Falls Rd. I hiked downstream and nymphed the runs with the caddis pupa. I was carefully working the seams in the first run without any hits when I was distracted by my cell phone and randomly tossed the fly back upstream to avoid hanging up on the bottom. No sooner had it hit the water than I had a fish on. It was a beautiful a six inch rainbow. Go figure. After a few more casts I moved upstream where I could see a few fish rising. I decided to fish both dry flies you recommended in tandem. It wasn’t long until I brought the first brown of the day to hand. Over the two hours I was able to fish, four brown between 9 and 12 inches were caught. All on the dry flies, most on the olive. The “dreary” day proved to be my most productive yet on the Gunpowder and I had the river to myself. All the fish had incredible color. I’m kicking myself for not taking the time to get any photos, but was having too much fun fishing. Thanks for the excellent advice as usual. For you literary types that need a painless turkey day toast I’ve rounded up some juicy one-liners by folks from Chicago, Avon and Rome. The shop will be closed on Thursday, November 26, in observance of the Thanksgiving holiday and will reopen Friday from 10:00 AM till 4:00 PM. The shop will be open from 8:00 AM till 4:00 PM on both Saturday and Sunday. Whether you’re getting some family members fly fishing, are in need of some football relief or just practicing in-law avoidance this week we’re happy to provide safe harbor. Thanks to all of our Gunpowder regulars from near and far that have shopped locally, provided excellent stream reports and shared their regard for the Gunpowder river and it’s colorful denizens. This entry was posted in fishing report on November 25, 2009 by Theaux Le Gardeur. The day was beautiful last Sunday when I fished the river. It was certainly brighter than October 31st when I had fished previously. Still, there were more bugs coming off on Halloween than last Sunday. Interestingly, I saw some spinners just upstream of Bunker Hill on the flat section above the small creek that comes in. To me they looked like olive spinners. They were small, and there weren’t great numbers of them. I also saw a few caddis, and some midges. One bug really got my attention. It was floating in still water. I picked it up. It was about a size 20 or 22. It had a cream colored body with some really bright blue on it. It had wings that looked just like the snowshoe hare fur used on flies. It was kind of a comical bug. There were none of the masses of size 16 midges prevalent on the 31st. Strangely, I caught only one fish on a streamer last Sunday. Everything was much slower than expected. That fish I got on that beautiful stretch of water above that long flat section I just mentioned. The stretch that makes a nice curve and that is bordered on the south bank by large Hemlocks. That water is very beautiful and has a greenish tinge; there are many large rocks on the bottom and good gravel. Rarely do I catch anything there. The flow is fairly fast and I wonder if I’m getting down deep enough. Anyway I worked my up to Masemore. There by the parking lot many fish were rising. I fished a Hemingway caddis and a Griffiths Gnat trailer. I got a number of strikes but no fish. It was there just as the bats were beginning their swoops that I saw a big bird up in the branches. Though I couldn’t see it clearly it was big enough to be a Bald Eagle. This entry was posted in fishing report on November 24, 2009 by Theaux Le Gardeur. The Gunpowder flow has dropped below 100 CFs, and is currently 52 degrees at Falls Rd. Rain is forecasted through the week, so expect water levels to rise again. Warm air temps and added spill over may increase water temps, and create ideal conditions for olive hatches with rainy, cloudy days ahead. Caddis, adams and small olives have worked for many anglers preferring to catch fish on the surface. 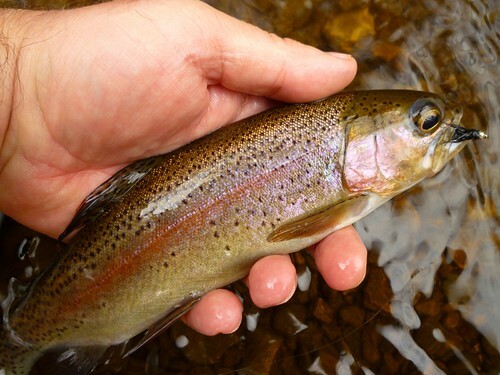 A few fish can be found rising to midges or olives, but the majority of trout are caught on dries fished blind. Nymphing with small nymphs and midge patterns sized 20-24 are working, along with larger caddis larva patterns. Streamers of all sizes and colors are catching fish, especially when the flows climb above 100 CFs. 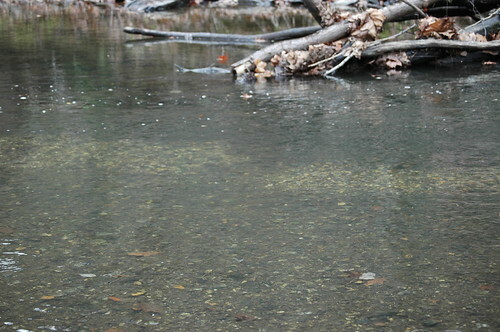 The past two weeks trout began making beds and started spawning in the Gunpowder river. Anglers should watch out for the redds (pictured above) and avoid wading or fishing through these areas. The light colored redds are clearly visible in lower flows, but in higher flows anglers should be extra cautious while wading, to avoid crushing fragile eggs. This entry was posted in fishing report on November 22, 2009 by Jason du Pont. Fly Fishing Maryland? Please join us for an intermediate Fly Tying Class on Sunday, December 13, 2009 from 9:00 AM till 12:00 PM. The class focuses on Gunpowder river nymph patterns. Our very own Gunpowder river guides will be teaching this fun-filled intermediate class. Cost of the class is $45 per person, and includes the use of materials. Please bring your own tools.The class is limited to six and pre-payment is required. Please give us a call at 410-329-6821 or drop us a line at info@backwaterangler.com to register. This entry was posted in events on November 19, 2009 by Theaux Le Gardeur. 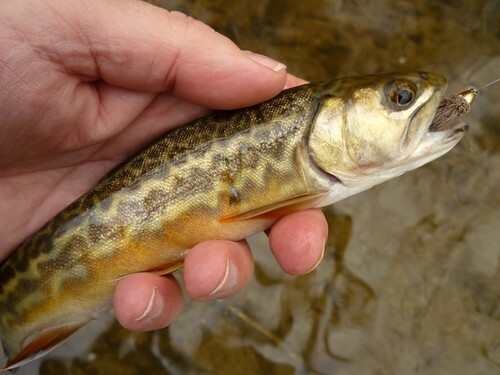 Fly fishing this Fall along the Gunpowder has yielded recent catches of tiger trout. I can assure you that not many of these fish swim in the Gunpowder but it’s certainly a testament that catch and release works folks! 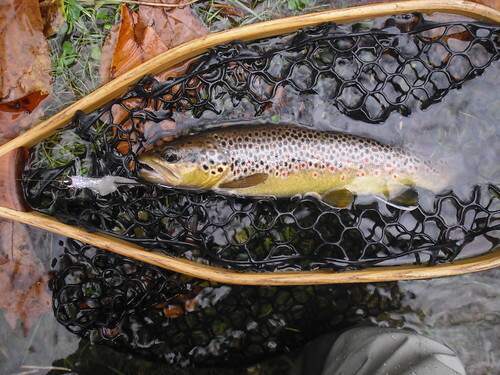 Following is a another great stream report and picture from Richard Gunion. Thanks Richard. I was fishing the big pool at the bridge near Hereford High School and caught this tiger trout. This is my first one. At any rate it jumped out the water about 3 ft and put up a good fight for it’s size. Let’s hope it gets bigger like around 16″. These fish are supposed to be aggressive and good fighters. There were a lot of people out yesterday everywhere on the Gunpowder. The following report sent in to us about two weeks later is from Jeff Aicroth describing the animal and a nice Fall day spent afield. Thanks Jeff. Wanted to drop you a quick note after seeing that pretty brookie on-line. Nice Pic.Last week, after visiting the shop, went to the Big Falls road access and started fishing about half way up the long straight from the bridge on the far side.The first fish was a good one tight to the bank which immediately nosed into an adjacent log pile and there the line stayed. Too deep to cross, and slack line didn’t help, and I was standing there debating on how to proceed…Finally decided the fish had given me the slip and I was hooked to a far away log. Put the pressure on and the line broke with no sign of an escaping fish (think he was long gone), so re-tied and returned to casting. Next fish was a beauty and oddly marked. Not big, 8-10″. Tried to use my cell phone camera but alas the memory was apparently full and no shot could be taken. It was basically a brown but had a distinct & much lighter flank with crowded spots tightly bordering it above and below, in addition it had the white edges on its lower fins and the upper spots were not round but more like a mottled pattern. Beautiful. Thinking hybrid. Certainly unique. Think I’ll start bringing a real camera – hate to miss not capturing this kind of beauty to share on film, so to speak. Final fish was a standard fare brown & a nice end to a brief but fulfilling afternoon.Thinking back, I believe they all fell for a caddis dry. This entry was posted in fishing report on November 19, 2009 by Theaux Le Gardeur. Fly Fishing Maryland? Please join us for a Beginners Fly Tying Class on Saturday, December 12, from 9:00 AM till 12:00 PM. It’s an introductory fly tying class that focuses on Gunpowder River favorite fly patterns. One of our Maryland river guides will be teaching this fun-filled beginners class. Cost of the class is $45 per person, and includes the use of tools and materials. The class is limited to six and pre-payment is required. Please give us a call at 410-357-9557 or drop us a line at info@backwaterangler.com to register. The Gunpowder river is flowing at 79CFs is clear and in the mid 40’s throughout the catch and release area. Nymphing up leaves is still a tough way to spend a day on the river. Streamer fishing with Zonkers and small Muddlers is a safe bet, especially in the fast water along the undercut banks. If you’re more inclined to fish light and long, trying small BWO’S in the flats on cloudy days. It’s hard to go wrong with a #18 Elk Hair Caddis on bright warm days in the riffles just make sure that it’s tied n to 6 or 7x tippet. 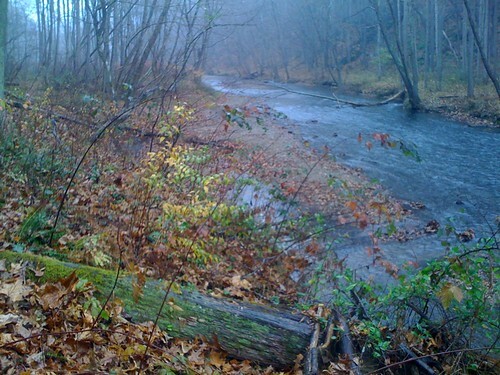 Thanks to Richard Gunion for the following stream report and picture from Big Hunting Creek. 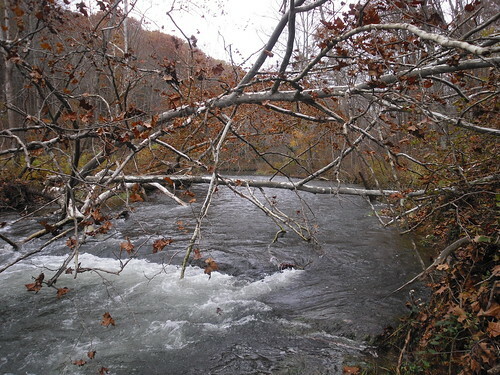 I just got back from a fishing trip to Big Hunting Creek on 10/27/09 and had a reasonably decent trip. At first not much was biting in the mid section near the concrete bridge as I tried dredging that pool for one of the big trout hiding under the ledge. There are probably some trout in there but not much luck. I tried the upper section and finally had some luck casting a streamer cross current. I caught a brown trout with slash-most likely an attack by a bird unless there could be a real monster of a brown trout in there. Downstream a little ways I hooked a rainbow which spent as much time in the air as the water. Throughout the day fish nibbled at my streamers. Casting streamers (dace pattern and black bead head wooly bugger pattern) cross current, against the current and with the current seemed to work. All in all I caught 1 brown and 2 bows. I was hoping for a brook trout but it appears that it is mainly browns and rainbows. The brook trout stocked earlier seem to be gone. Most of the trout in there are around 10-12″. The stream is in good shape unlike earlier in the summer when water levels were very low. Fall foliage is at its peak right now though not much longer. This entry was posted in fishing report on November 18, 2009 by Theaux Le Gardeur. Fly Fishing Maryland? Please join us for an intermediate Fly Tying Class on Sunday, December 6, 2009 from 9:00 AM till 12:00 PM. The class focuses on Gunpowder river parachute patterns. Our very own Gunpowder river guides will be teaching this fun-filled intermediate class. Cost of the class is $45 per person, and includes the use of materials. Please bring your own tools.The class is limited to six and pre-payment is required. Please give us a call at 410-329-6821 or drop us a line at info@backwaterangler.com to register. This entry was posted in events on November 12, 2009 by Theaux Le Gardeur. Fly Fishing Maryland? Please join us for a Beginner’s Fly Tying Class on Saturday, December 5, from 9:00 AM till 12:00 PM. It’s an introductory fly tying class that focuses on Gunpowder River favorite fly patterns. One of our Maryland river guides will be teaching this fun-filled beginners class. Cost of the class is $45 per person, and includes the use of tools and materials. The class is limited to six and pre-payment is required. Please give us a call at 410-357-9557 or drop us a line at info@backwaterangler.com to register. This entry was posted in events on November 10, 2009 by Theaux Le Gardeur. 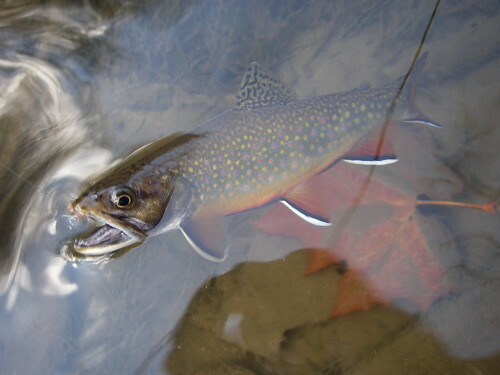 The Gunpowder is still providing numerous opportunities and surprises for dry fly fishermen, as this photo of a brook trout taken by Neil Stahl illustrates. I was fishing tricos to risers just downstream of him when he caught it, and we found fish looking up in most pools and riffles we fished. Blue Wing Olives and Tricos are still on the water mid morning, although waves of emerging bugs and rising trout are sporadic on colder days. The past two weeks large midges in a size 16 were hatching in big numbers on warm days and bringing trout to the surface. On a guide trip this week, the biggest brown of the day took a nymph, but the majority of fish preferred a dry fly fished blind in the riffles. We hooked slightly less than half of the strikes on the dry, ending the day with seven browns in the net, which isn’t too bad for a first time angler on a windy November day. The Falls Rd stream gauge is currently at 86 CFs, while the Glencoe gauge is at 195 CFs. The C & R sections are down to great levels for dries, while the lower river is prime for streamer fishing. A number of anglers passing through the shop experienced some great fishing this week and caught some nice trout on homemade streamer patterns. Many tyers are getting innovative using hair, feathers and fur for streamers, but for me the flashier synthetics are proving to be irresistible when the flows increase. The brown trout above fell for a large Psuedo Chub on 3x tippet, as the water dropped below 150 CFs in the C & R section. This entry was posted in news on November 8, 2009 by Jason du Pont.